Lock in a great price for SENTIDO Bluesun hotel Berulia – rated 9.4 by recent guests! We loved everything about the resort and even stayed an extra night. The staff was very accommodating. The dinner got better each day. The breakfasts were great. We took advantage of the spa services. It was a very nice experience. 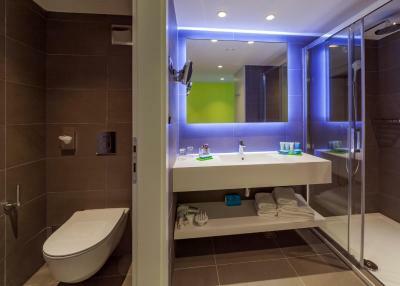 Great for a chilling holiday seconds away from the beach, modern, fresh & clean. Food options for all was exceptional for both breakfast and evening meal. Option to walk along the shoreline for over an hour in both directions with a good mixture of shops and bars. Nice environment, close to the beach, good food, facilities, parking. the checkin was very quick, we got upgraded to an amazing room with its own patio and access to a pool. A welcome drink upon arrival was a very nice touch. The hotel organized events every day, the pool was fabulous and always had loungers available plus the hotel is right by the beach which is another option to the pool. The gym was fabulously equipped and breakfast was just superb. Food quality and choice were very good. Lots of loungers by the pool and plenty of shade. Most of the staff were very good and worked very hard. Beaches and sea are stunning. Our room had a lovely view. We received a "deluxe room" instead of the "standard room" we booked. Thus we enjoyed a private acces to a pool (opened only for few people having a deluxe room). All with a view on the sea. This hotel was very calm, maybe 2 activities per day with music and for the rest of the time, we heard just nothing. The hotel had a private beach very nice and not crowded! SENTIDO Bluesun hotel Berulia This rating is a reflection of how the property compares to the industry standard when it comes to price, facilities and services available. It's based on a self-evaluation by the property. Use this rating to help choose your stay! One of our top picks in Brela.Completely renovated in 2017 and set in a fragrant Mediterranean garden right next to the Berulia Beach in Brela, SENTIDO Bluesun hotel Berulia features 3 restaurants and 2 outdoor pools, each with their sun terrace offering sea views. Free WiFi is provided in all areas. All air-conditioned rooms at the Berulia come with a balcony offering sea views and have a flat-screen satellite TV, as well as a mini-bar and a private bathrooms with a shower, a hairdryer and free toiletries. Deluxe rooms have direct access to the unique swim-up pool. Entertainment staff offers a variety of animation programs for both children and adults, taking place in the green garden right by the beach. You can exercise in the beach-side fitness area, while enjoying the sea view and listening to a personalized music playlist. The Posejdon is an authentic Dalmatian tavern where you can taste traditional local cuisine, while the Puž Restaurant has a beach terrace and serves grilled meat and fish specialties. The pool bar provides a selection of tapas. Brela and Baška Voda resorts can both be reached in a 5-minute walk from the SENTIDO Bluesun hotel Berulia. Organized day trips to Biokovo Nature Park, Split, Dubrovnik and other destinations are also available. 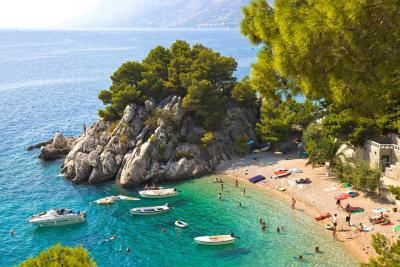 The town of Makarska is 7.5 mi from the hotel, while Split is at a distance of 31 mi. Split Airport can be reached in 65 mi. This is our guests' favorite part of Brela, according to independent reviews. This property also has one of the top-rated locations in Brela! Guests are happier about it compared to other properties in the area. This property is also rated for the best value in Brela! Guests are getting more for their money when compared to other properties in this city. When would you like to stay at SENTIDO Bluesun hotel Berulia? This air-conditioned room features an LCD satellite TV, a mini-bar and a safe. The private bathroom comes with a shower and a hairdryer. This spacious, air-conditioned room features a sofa seating, an LCD satellite TV, a mini-bar and a safe. The private bathroom comes with a shower and a hairdryer. Featuring a balcony with views of the pool area, this spacious, air-conditioned room offers a sofa seating, an LCD satellite TV, a mini-bar and a safe. The private bathroom comes with a shower and a hairdryer. Offering sea views from a spacious terrace fitted with 2 sun loungers, this larger room consists of an LCD satellite TV, a mini-bar and a safe. The glass-wall bathroom comes with a shower. There are so many benefits to staying at the Berulia, be it the unique location right above a secluded beach, the marvelous sea views or the romantic atmosphere of Mediterranean pine trees in the garden. Depending on the direction you take, a pleasant walk along the sea will take you to Brela or Baška Voda, 2 of the most popular resorts on the Makarska Riviera. Berulia is part of Bluesun Hotels & Resorts, a company that includes 15 hotels, campgrounds and resorts all over Croatia. More than 150,000 international guests per year choose Bluesun hotels for their vacations. House Rules SENTIDO Bluesun hotel Berulia takes special requests – add in the next step! SENTIDO Bluesun hotel Berulia accepts these cards and reserves the right to temporarily hold an amount prior to arrival. Amounts of the lunch and dinner supplements listed in the booking confirmation are only valid for online bookings. In case you order supplement meals on site at SENTIDO Bluesun hotel Berulia, the price of lunch is 19 EUR per person, while the price of dinner is 21 EUR per person. Payment has to be made in HRK (cash or credit card) according to the current exchange rate. The food was lacking, lots of choice but not great quality. The location was good but not easy to get to other dining places. Clean and quiet. Friendly staff. The coffee was missing in the minibar on 2 occasions - but swiftly supplied when asked for. The spoons were not cleaned and left dirty in the minibar by the cleaners, but it was not a major inconvenience for us to wash them ourselves. The hotel is set on a hill and does not have lift access to all the levels so if you are disabled- it might be a bit difficult. Only one thing really annoyed me. On my birthday we asked to eat at the a la carte restaurant and this was fine - but there is no monetary allowance given for people on half board - and I found this a little inflexible. Would have been nice for someone to wish me a happy birthday - that wouldnt have cost anything. Food (at the buffet) was diversified as possible, not bad but it missed a bit flavors in it. Great for some days but not for weeks I think. Thought, is it possible to eat at some restaurants in the hotel which I did not test. Or other restaurants around. That is the only point I can mark on our journey which was wonderful. Beach was nice, but way over crowded. You need to pay for beds on a beach, but it was way too busy for our likening. Avoid August, would say. Staff were absolutely great! Very clean, close to beach and shops. Food was a bit repetitive for dinner buffet, very good breakfast with lots of choices. Close to Brela and even closer to Baska Voda. Before we leave,it was 9.00 am in the moring and the check out was at 11.00 am,a young boy came in our room to check the minibar?!! I was in the shower,and my girlfriend in bed,so i didn’t understand these procedure. In rest was ok,and i thing the money are a little bit expensive,if you compare with other 5 star hotels,price is on the same,we payed for 3 nights on booking 908€(303€/night) with breakfast included,so in my opinion is not cheap at all!!! Thank you for all beside that we loved everything! Everything was almost perfect It is a 4 star superior hotel,the best in Brela,and all Makarska riviera!! !